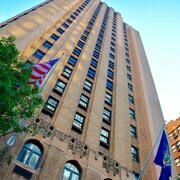 With a stay at Bentley Hotel, you'll be centrally located in New York, convenient to Bloomingdale's and Barney's. This 4-star hotel is close to Rockefeller Center and Chrysler Building. Make yourself at home in one of the 197 air-conditioned rooms featuring minibars and flat-screen televisions. Wireless Internet access (surcharge) keeps you connected, and cable programming is available for your entertainment. Private bathrooms have designer toiletries and hair dryers. Conveniences include phones, as well as safes and desks.